There were still many inches of snow on the ground on January 11, when Jason Gagne, wearing snowshoes, began tapping maple trees throughout his woods in Highgate, Vermont. In a perfect world, Gagne wouldn’t start until mid-February, when the weather is more hospitable. 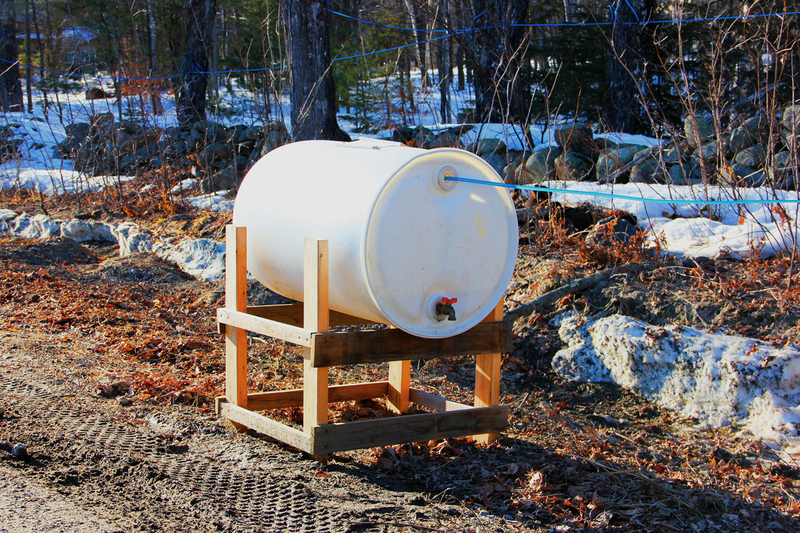 But, he says, “I’ve got 22,000 trees, and I wanted to be done by March 1.” That’s about when sap starts to run as freezing nights give way to mornings of thaw, commencing six weeks of boiling the sap down to syrup for sugarmakers throughout the Northeast. Fortunately, he was finished by then. Gagne is a fifth-generation farmer whose family once derived most of its income from dairy, with maple syrup a spring-season sideline. The family gave up their 80 cows in 1991after dairying became for them, as for so many others then and now, too financially precipitous. These days, the Gagnes rely entirely on organic maple syrup for their livelihood. Last year, they produced 14,000 gallons of it, most of which they sold to Coombs Family Farms in New Hampshire to distribute under Coombs’ national label. The steadier income has enabled them to keep their land and buy more from neighbors who also kicked the milk bucket. Currently, the Gagnes own 350 acres of forest in the northwestern corner of the state, ensuring it doesn’t meet a now-common fate: razing. As New England works to keep its dwindling forests from disappearing altogether, environmental organizations and state ag and forestry departments are realizing that incentivizing maple can help make those forests financially viable for farmers and other landowners who might otherwise be inclined to timber them or sell them to developers. The burgeoning maple industry — valued at $140 million in 2017 — can also support the protection of intact, healthy forests, and a forest that lives to grow another day can provide increasingly critical carbon and other ecological benefits to our warming and de-diversifying earth. However, questions remain as to whether maple’s swift growth could have unforeseen negative consequences. Whereas timbering has long been a mainstay in the Northeast, sugarmaking has been on the rise over the last decade. Vermont went from producing 500,000 gallons of syrup in 2004 to over 2 million in 2018. In part, this growth is thanks to new technology that’s seen hand-collected buckets of sap replaced by tree-to-tree tubing systems hooked up to vacuum pumps that have made extraction and collection quicker, easier, and twice as bountifulven as climate change causes unpredictable sugaring conditions. “New techniques have helped us have good crops even with poor weather that would have been disastrous 30 year ago,” says Arnold Coombs, Coombs Family Farms’ director of sales and marketing. The industry’s surge is also due to an uptick in consumer interest in all things “local” and “natural,” leading to a proliferation of maple-y products everywhere you look (maple pecan latte, anyone?). There’s also a growing international market for maple. As a result, family farmers like the Gagnes have been able to find some respite in an agricultural niche that is, for the moment, lucrative. Hot on the heels of family farmers’ success with maple has come, of course, “Big Maple”—industrial-scale sap-extracting operations that are corporate-owned or -financed. In Vermont, this is typified by the Maple Guild, which opened in 2013 in Island Pond and today collects sap from 400,000 taps to make products such as maple water and maple vinegar. On paper, at least, the overall environmental impact of maple syrup seems positive. Temperate forest of the sort that supports a sugarbush has a lot to offer a planet. For starters, it can be a net carbon sink, pulling in more carbon dioxide from the atmosphere than it puts out, and storing it in branches, trunks, roots, and soil. Forests in Vermont absorb half the state’s emissions, according to forester Robert Turner of Vermont Urban and Community Forestry. They also clean the air and water, and provide shade, habitat, and food for all manner of wildlife. And yet, across New England, 65 acres of forest are lost each day, according to a 2017 Harvard Forest report; the region is on track to lose an additional 1.2 million acres by 2060. Vermont, which produces 47 percent of U.S. maple syrup, is losing 1,500 acres of forest a year. New York, a central Atlantic state that produces 20 percent of the country’s syrup, is holding its forests steadier at almost 19 million acres, but it’s also seen a 1.4 percent decline from 2012 to 2017. The surge in maple has happened before anyone has effectively measured what some of its wide-ranging effects might be. Several New England nonprofits are taking a closer look at some of the challenges, though. “It’s an interesting and complicated question to peek into, but on a superficial level, there is value in keeping biomass standing for carbon sequestration, for wildlife habitat, and for by-products [like] maple syrup,” says Bill Patterson, a senior field representative with The Nature Conservancy (TNC), an environmental nonprofit. TNC owns 1,300 acres of once-timbered sugarbush in northern Maine that it leases to sugarmakers. Five years ago, it conducted a survey that concluded that “wildlife habitat and financial values lined up more favorably with sugarbush than timber,” says Patterson, at least on larger parcels of land. One of the ways it’s profitable for landowners: “A steady stream of income from tap lease fees” from sugarmakers, Patterson says, which defray costs of land ownership, like taxes. Another way is through carbon credits, in which regulated businesses that can’t reduce their emissions to required levels can purchase offsets. TNC’s sugarbush was once owned by a paper company, which intensively harvested its mature trees. In trying to restore it, TNC found the regrowth of its carbon stocks disappointing. So, it partnered with the Climate Trust, a nonprofit investment organization, to sell carbon credits to offset emissions from, say, power plants in California. As of this writing, carbon was selling into the offset market for over $13 per ton, which could translate into as much as $100 per acre of sugarbush, depending on how much carbon it stores—in the very simplest terms, this would be more for an older growth forest than a young one. Participating in the carbon market “afforded us the opportunity to reduce our [own timber] harvest, which will lead to a significant acceleration in the amount of carbon we sequester for the next 10 years,” says Patterson. Ecosystem services improve when a forest is well-tended. Most sugarmakers say that it’s in their own interest to follow best forestry practices in their sugarbushes, and guidelines exist both through state and other entities. However, some are more rigorous than others. Organic standards for maple syrup require sugarmakers to write up a forest management plan that maintains stands that are diverse in types and ages of trees and other plants—only 75 percent can be sugar maples—and addresses habitat for animals and insects. They also establish how and how much to thin trees, what kind of equipment is too damaging to roll around them, and how to maintain woodland roads and paths. These provide “ecological sustainability” in ensuring little to no damage to the surrounding environment. Read more Civil Eats: Is Detroit Finally Getting a Black-Owned Grocery Store? Organic standards have some overlap with standards that Audubon Vermont established for its “bird-friendly maple” label (the organization is considering seeking a third-party certifier for it). Audubon Vermont also requires a 25 percent diversity of species in the forest — birch, beech, hemlock, red spruce, for example. They’re looking for a large overhead tree canopy, robust middle and lower stories, and two “snags,” or dead trees, per acre, says Steve Hagenbuch, a conservation biologist with the organization. These sorts of measures attract birds like redstarts, warblers, nuthatches, and tanagers by providing ideal habitat for both the birds and their insect food sources. Hagenbuch’s research helped Audubon Vermont figure out how to “mesh these two incredibly important resources — summer breeding habitats for birds, and [Vermont’s] number-one product,” he says. Their standards—hashed out with other private and public stakeholders — also help to minimize the effects of invasive pests and pathogens. 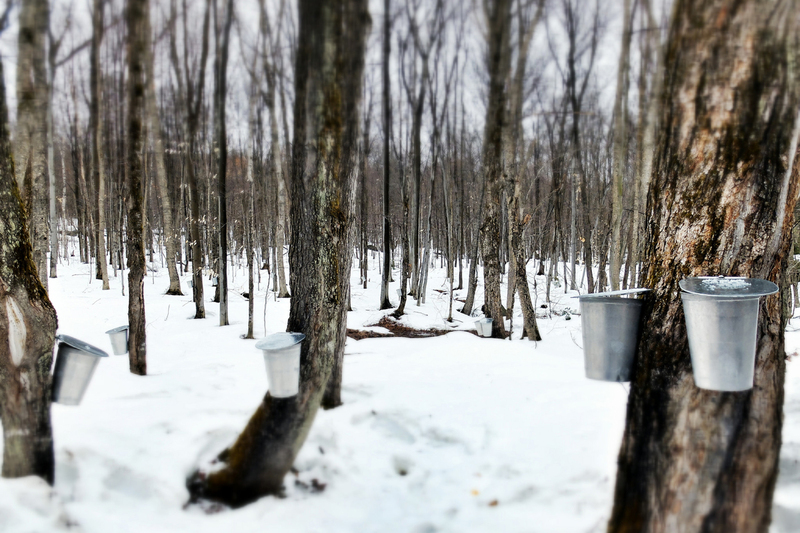 New York State, too, has developed a set of “environmentally responsible” forest best practices for sugarmakers who want to market through its New York State Grown and Certified Program. And both its senators supported the Acer Access and Development Program in the 2018 Farm Bill, which provides grant money for research into maple syrup production. “There’s not enough maple research left in the U.S.,” says New York State Maple Producers Association executive director Helen Thomas, noting its relevance and importance, not only in the face of pests and climate change, but also in creating a strong agricultural forecast for farmers. “There’s too much competition in the dairy industry, and we don’t have big wheat farms. So the future of agriculture in New York is specialty crops like wine and hops—and maple,” she says. The state’s Department of Environmental Conservation is currently studying whether its forests can help reduce its carbon emissions, and considering recommending an assessment of maple production to the Carbon and Applied Forestry Research Institute it recently established. Unlike Vermont, which according to Thomas has tapped most of its tappable trees, New York currently only taps 5 percent of its trees, she says. But along with this potential comes the likelihood that more large, Maple Guild-like enterprises will look at the state’s forests and see dollar signs. That means the question about ecological impacts of sugaring applies to New York, too, and perhaps takes on even greater urgency. 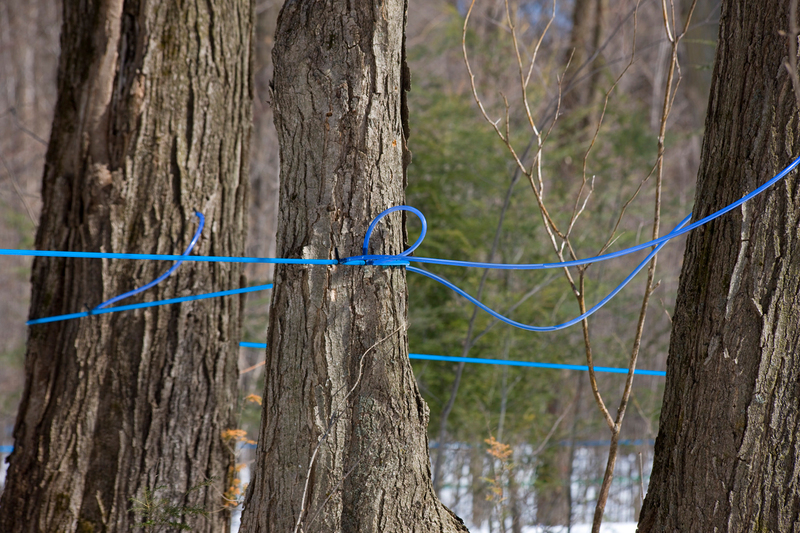 Even though the Maple Guild is certified organic and adheres to those stringent forestry standards, Hagenbuch says we still have no idea how to gauge the effects of plastic tubing snaking though an industrial-size sugarbush on, say, the movement of animals like moose and black bear. Will sugaring on a vast scale damage valued resources? “We just don’t know the answer to that,” Hagenbuch says. Now would be the time to find out.